"No audio product...has revealed more of what's happening on each recording than the MAXX 2." releases from the large cabinets with great quietude, helping to create the MAXX 2s' realistic sense of speed and dynamic prowess"; all of this leads to a "highly resolving and highly enjoyable nature." Features "The first update to the MAXX platform in five years"; has a new tweeter, a new internal structure for the tweeter/midrange module, a new tweeter/midrange crossover and a refined bass crossover; "owners of the original MAXX can have their speakers upgraded for the $6000 difference in price." Use As with other Wilson Audio speakers, the MAXX 2s can be driven with a stout SET amp -- amplifier power is much less of a concern than amplifier quality; "don't even attempt to walk these speakers around on their spikes, even if you think you are strong enough to do so." that they are obviously cut from the same sonic cloth as the far more expensive X-2 Alexandria at least suggests that they may be a bargain of sorts." Early last month I made a trip to Provo, Utah to visit the Wilson Audio facilities and hear the Alexandria X-2. I visited Wilson Audio in the summer of 2000 as well, and during that trip I was able to hear two audio systems that were extraordinary in every way. One was that of Wilson Audio marketing director John Giolas, and it featured MAXX speakers and Atma-Sphere amplifiers. The other was David and Sheryl Lee Wilson's system housed in the couple's enormous purpose-built listening room. The centerpiece was a Wilson Audio WAMM speaker system. Both of these audio accumulations made my personal list of the best-sounding systems I've heard, and both were in the top five. They remain there to this day. Back to the near present and the $125,000 USD Alexandria X-2s, which I heard with Mark Levinson and Audio Research electronics, and Transparent Audio cabling. 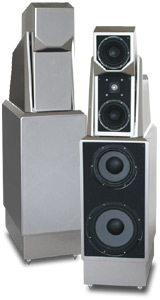 The demo was set up as a comparison between the X-2 Alexandria and the X-1 Grand SLAMM Series III, Wilson Audio's previous top integrated speaker system (the now-discontinued WAMM has four separate pieces). Leaving aside the comparison except to say that the X-2 is a significantly better speaker than the X-1, I can say that this audio system, with new speakers, also cracked my personal top five. I don't have to pause and consider whether to call the X-2 Alexandrias revolutionary audio products. The way music emerges from them is unique -- from a starting point of such remarkable blackness and low distortion that their immense dynamic capabilities and unmatched resolution will recalibrate your idea of reproduction on the fly. That is, unless you've heard the MAXX Series 2, a speaker that takes advantage of the proprietary technology developed for the massive and massively expensive X-2 and puts it to use in a smaller speaker that's far less costly and yet more full-range than any I've heard in my audio system. If you long for the X-2 but can't afford it, you'll want to investigate the MAXX 2 -- and that's something with which I can help. Wilson Audio introduced the MAXX in 1999 as the speaker between the very successful WATT/Puppy and X-1 Grand SLAMM. At the CES this year, Wilson Audio unveiled the Series 2 MAXX, the first update to the MAXX platform in five years. The MAXX 2 uses a new tweeter that is said to offer significant improvement in high-frequency linearity and a reduction in coloration and noise; a new internal structure and rear-firing port for the tweeter/midrange module; a new tweeter/midrange crossover that uses technology developed for the X-2 Alexandria; and a refined bass crossover that reportedly improves the linearity and integration of the drivers. The original MAXX sold for $38,900 for the entire time it was available. The MAXX Series 2 sells for $44,900, and owners of the original MAXX can have their speakers upgraded for the $6000 difference in price. This amount doesn't seem unreasonable given that among the things that are done is the machining of the aforementioned ports into the existing tweeter/midrange modules. The MAXX 2 also uses a trio of new grilles (which are attached by a new method) that improve the appearance of the speakers tremendously. The original MAXX looked boxy because of its grilles, but the MAXX 2 has more of a Wilson Audio family resemblance with its angular, contemporary good looks. The new grilles come in a number of shades, and, as with other Wilson Audio speakers, the MAXX 2 makes full use of the WilsonGloss palette, including custom colors, allowing for a huge array of grille/speaker combinations. Want your MAXX 2s in your college colors? Wilson Audio can probably do it. As with the original MAXX, the MAXX 2's cabinet is a combination of Wilson Audio's harder-than-steel X material and more-dense-than-MDF M material used strategically in thicknesses of up to 3". The cabinet is intricately braced, which makes it very rigid and inert. Peer into the large machined-aluminum port on the back of the bass cabinet and you can see the labyrinth of braces along with the damping material inside. The MAXX 2's custom-made drivers include a 1" Focal inverted-titanium-dome tweeter, a pair of 7" ScanSpeak carbon-fiber midrange drivers, a 10" Focal upper-bass driver and a 12" Focal woofer. However, each is taken apart and rebuilt by Wilson Audio, and as I can attest from my recent visit, you would not think they are the same drivers before and after modification. The MAXX 2 measures 63"H x 17"W x 22"D and weighs 400 pounds, with the bass cabinet accounting for 80% of this weight. The MAXX 2 dwarfs the WATT/Puppy 7 and is only a little smaller than the X-1 and X-2. Two pairs of leads protrude from the top of the bass cabinet and connect to the tweeter/midrange module, with connection to the amplifier occurring at the bottom of the bass cabinet. I don't know what the crossover points are -- Wilson Audio isn't telling. All binding posts are proprietary gold-plated numbers that accept spades only. The MAXX 2 comes with a very informative manual that could help you assemble and position the speakers in a pinch, but luckily your Wilson Audio dealer will undertake this toil after purchase, an add-on of no small value given the size, weight and complexity of these speakers. Wilson Audio specs the MAXX 2's frequency response as 20Hz-21kHz, its sensitivity as 92dB (2.83V at one meter), and the minimum power required to drive it as 7 watts. We've found through measuring the WATT/Puppy 6, WATT/Puppy 7 and Sophia that Wilson Audio's sensitivity specs are within a negligible degree of difference from our measured values (this is not the case with all other companies and their speakers). Therefore, you can trust that the MAXX 2 is 92dB sensitive. The MAXX Series 2 speakers were delivered in three wooden crates: one for each of the bass cabinets and one for both tweeter/midrange units -- 1100 pounds total. However, because there were no steps into my house to negotiate, I was able to uncrate the speakers and muscle them into my listening room by myself. The bass cabinets are shipped on casters, so it was easy to roll them out of their crates (once I stood the crates on end) and through my front door. The midrange/tweeter units are larger and heavier than the WATT, but they are not so bulky that they cannot be lifted and carried. 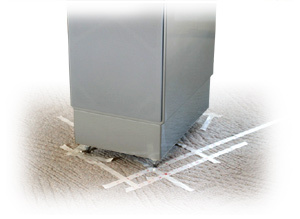 All cabinet surfaces are covered with a sticky plastic film that protects the paint job during transit (and should be removed shortly after so it doesn't mar the high-gloss finish), but the crates themselves are the loudspeaker equivalent of a feather bed, so well do they protect what's inside. As he did for other Wilson Audio speakers I've written about, John Giolas set up the MAXX 2s following the precise and lengthy Wilson Audio voweling-in routine, but this time with the aid of Trent Workman, Wilson Audio's overseas-sales manager. While John took measure of the room, walking around it and speaking to determine its character, he demonstrated to me how the room's intrinsic sound changed as he moved from boundaries to the center and back again. Eventually he settled on areas for the speakers, which he marked off with masking tape on which he inscribed distances to the side and front walls. Interestingly, where the MAXX 2s ended up was very close to where I had set up the ProAc Response D38 and Energy Veritas V2.4i speakers I reviewed earlier this year. 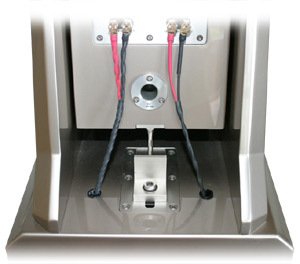 Assembly of the MAXX 2 requires seating the tweeter/midrange unit between the "wings" on top of the bass cabinet. Three spikes on the bottom of this module isolate it from the bass cabinet, with the spike at the rear resting on a machined aluminum block that moves forward and back, thereby allowing for adjustment of the angle of the top unit. Calculations based on the distance to the listening seat and the height of the listener's ears govern which one of the 16 steps on the block is used. All of this addresses time and phase alignment of the drivers, which Wilson Audio considers a cornerstone of proper loudspeaker design and setup. Fine-tuning occurred as John and Trent played portions of tracks, some with prodigious bass, and moved the speakers one way and then another. The speakers ended up roughly 46" from the side walls and 49 1/2" from the front wall of my 20' x 29' listening room with 114" in between. Toe-in was such that the output of the speakers intersected at my listening seat, which was placed 8' from the front corners of the speakers. All of this took an afternoon to finalize, with John directing Trent to move the speakers mere fractions of an inch near the end of the setup gymnastics. Once properly placed, the MAXX 2s were spiked, at which point they are immovable without a lot of help. Don't even attempt to walk these speakers around on their spikes, even if you think you are strong enough to do so. One false move and you'll be pleading with the paramedics to be careful as they prop up the speaker to unscrew the spike that has speared your foot. I was fortunate to have four very good amps here to use with the MAXX 2s, each different in technology from the others. I used Lamm M1.2 Reference and ML2.1 along with Atma-Sphere MA-2 Mk II.3 monoblocks for the bulk of the review period, with a pair of Simaudio W-6es also seeing time. I had no doubt that the solid-state W-6, hybrid M1.2 Reference and OTL MA-2 Mk II.3 mono amps would drive the MAXX 2s, but the ML2.1 SET amps were not a sure thing in my mind. Read on for details. Other electronics included Lamm L2 Reference and Atma-Sphere MA-1 Mk II preamps; Esoteric DV-50, UX-1 and X-01 digital players; Mark Levinson No.37 and 47 Lab PiTracer transports; and a Zanden Model 5000 Mk III DAC. Interconnects and speaker cables were from Siltech (Signature G6 Forbes Lake and Signature G6 Eskay Creek), Nordost (Valhalla), DH Labs (Revelation and Q-10), or Acoustic Zen (Silver Reference II and Hologram II), with the Siltech cables being my choice for their synergy with the MAXX 2s as well as the Lamm and Atma-Sphere amps. Power cords were from Shunyata Research (Anaconda Vx, Anaconda Alpha and Taipan) and Siltech (Signature G6 Ruby Hill), with power provided and conditioned by a Shunyata Research Hydra Model-8. As with all Wilson Audio products, the MAXX 2s are made to standards that other companies don't achieve, let alone aspire to. They are expensive speakers for sure, but everything in their design, manufacture and presentation underscores their status as extreme luxury products. There just isn't anything quite like them -- except another Wilson Audio speaker. Goosing a particular region of a speaker's frequency response can trick listeners into thinking that the speaker offers high resolution. But true resolution is a function of a speaker's complete performance, its ability not only in the frequency domain, but also its dynamics, lack of distortion, bandwidth, time and phase correctness, and a host of other parameters. Recent-vintage Wilson Audio speakers have arrived at a balance of sonic characteristics different from, and significantly better than, their predecessors. This is quite a statement given how well received the WATT/Puppy, MAXX and Grand SLAMM have been. How the speakers have arrived here is a matter of refining design elements, not an attempt at revoicing -- goosing -- the speakers. The detail and precision that marked earlier Wilson Audio designs are still present; in fact, the latest speakers may be even more detailed and precise. Since 2000, SoundStage!, in conjunction with the National Research Council located in Ottawa, Canada, has been producing what we believe are the finest loudspeaker measurements published online or in print. These include measurements of three speakers from Wilson Audio: the WATT/Puppy 6, Sophia and WATT/Puppy 7. All have good measured performance, and their manufacturer-supplied specifications have been close or identical to our measured values. With regard to this review of the Wilson Audio MAXX Series 2, then, the obvious question is, Why are there no measurements, particularly when weve measured other Wilson Audio speakers? The answer is simple: the MAXX 2s are too big. The NRCs anechoic chamber is large enough to accommodate a dimensionally large speaker -- weve measured the Soliloquy 6.5, for example, which is a tall floorstander. Weve also measured the largest models from companies such as Paradigm and Energy. The MAXX 2, though, is greater than five feet high and two feet deep. It dwarfs any other speaker we've measured. In the chamber, we can't get the microphone high enough or far away to do proper measurements of this very large speaker. Theres also the problem of the MAXX 2's 400-pound weight. We place all speakers on a rotating turntable inside the chamber. The turntable allows us to position the speaker at precise increments for the corresponding on- and off-axis measurements. The turntable, though, supports a maximum weight of 400 pounds -- the MAXX 2's weight. The manpower needed to carry the MAXX 2 into the chamber would be equally stressed. Finally, there is the matter of the chamber itself. Deep bass needs ample space to develop, and while the NRC's anechoic chamber is of a suitable size for the low-frequency response of most speakers on the market, the MAXX 2 is not like most speakers. We could not be sure that the NRC's chamber would give accurate readings for the MAXX 2's bass response. It is in the realms of true resolution and complete performance that the MAXX 2s excel. No speaker -- no audio product -- that I've used in my system has revealed more of what's happening on each recording than the MAXX 2. Consider the MAXX 2s' bandwidth. I can't attest to how high the tweeter will go (my hearing will give out before the MAXX 2s' high frequencies will), but I can say that the MAXX 2s' bass is deeper and more powerful than that of any speaker I've used. The lowest and most powerful sounds -- electric bass, bass drum -- simply appear, and just as you get ready for at least a little slop or overhang, they disappear with realistic speed. Wilson Audio has devised a way to make big woofers sound quick and athletic, like smaller ones. The low frequencies on the various Telarc Jacques Loussier Trio recordings are generous. This can lead to muddy, suffocating sound with the wrong speakers, or enveloping weight and warmth with the MAXX 2s. On some numbers, such as "Gavotte in D Major" from Plays Bach [Telarc CD-83411], the kickdrum and upright bass have a punchy nimbleness that, when mated to the weight, makes for low frequencies that sound more varied and real. Lesser speakers force you to adjust your standard for reproduction downward by varying degrees; not the MAXX 2s, which first surprise and then persuade. Then there is dynamic range; the MAXX 2's is gargantuan. I documented in my review of the Simaudio W-6 monoblocks that the MAXX 2s can play PA-system loud, in which case the music is simply a replica of itself at lower volumes. The MAXX 2s inject no harshness or compression. However, what's more surprising is how articulate the MAXX 2s are at the low end of the volume scale, not only when minute detail is part of the recording but also when the speakers are merely played at low volume. More than any speaker I've heard, including the WATT/Puppy 7, which sounds very good at low levels, the MAXX 2 is a speaker for late-night listening, especially if you don't want bass frequencies to disappear just because you don't have the volume halfway up. At the opening of Sviatoslav Richter's performance of Beethoven's Piano Sonata No.23 on the new JVC XRCD24 [JVC JM-XR24017], the playing is so low that it's masked by the noise floor of the 1960 recording. The playing is veiled to such a degree that you almost expect someone to ask, "Is this thing on?" And then -- thunder. The immediacy of the transition over the MAXX 2s, from very soft to loud, will have you jumping out of your seat, but what's more interesting is the way these big speakers resolve the dynamic shadings of this solo-piano recording. You hear the hiss and Richter's light touch on the keys. Then there's power and passion, and you're glued to the performance. Both the bandwidth and dynamic range of the MAXX 2s lead to more general qualities, such as the speakers' highly resolving and highly enjoyable nature. With some audio products, resolution and enjoyment are at odds because the level of resolution is not realistic, showing either emphasis or obscurity. Not so with the MAXX 2, which presents all elements in perfect proportion to each other, casting an utterly believable assemblage of musicians and spatial cues. Given all of the setup involved with a pair of MAXX 2s, it is a good thing that there is a sure-fire way of knowing that they (and any large Wilson Audio speakers) are positioned optimally. Play something simple, perhaps a mono recording or one of a solo instrument. The speakers should disappear as sources of the sound, leaving only the music behind. It's an illusion of sorts -- two very large speakers that you can't miss with your eyes but can't localize with your ears -- and it leads to speakers that convey the scale (small or large) of a recording with remarkable aptitude. Two very different remastered CDs that I've been enjoying display this well. Thelonious Monk Plays Duke Ellington [Riverside RCD-201-2] is an old favorite that is now a 20-bit K2 remaster. It sounds small and quaint, Monk's playing at a casual saunter. Dave Brubeck on Time Further Out [Columbia/Legacy CK 64668] is no less deliberate, but the arrangements are more expansive, as is the recording itself. Over the MAXX 2s, these two CDs sound different, but both are presented with the utmost authenticity, their instrumental lines easy to follow, their performances easy to digest and appreciate. When it comes to high-resolution digital, the MAXX 2s really strut. For my recent review of the Esoteric X-01, I used the MAXX 2s to evaluate that player with the Esoteric UX-1 and DV-50 -- a painstaking task to be sure. I listened to dozens of recordings on this trio of playback devices, and the MAXX 2s readily exposed the differences among them -- to the point that the X-01 and UX-1, which look identical and share quite a bit of technology, were clearly defined. I am convinced that such a comparison would have been much harder, or perhaps impossible, to pull off with another speaker. The MAXX 2s responded to changes in equipment like no other speakers I've heard. I initially used the speakers with Atma-Sphere MA.2 Mk II.3 amps, with which they absolutely sang. I switched to Lamm M1.2 Reference amps, which output exactly half the MA-2 Mk II.3s' 220 watts, and the sound was still terrific, albeit different. Much later and near the point where I would begin writing this review, I received a pair of Lamm ML2.1 SET monoblocks, the updated version of the well-known ML2. Because of the way the speakers performed with amplifiers that were much more powerful, I was not hopeful that the ML2.1s would be as satisfying. I was too fond of what I was hearing! So with some reluctance, I connected the ML2.1s, let them warm up, and then took a listen. Not only could the ML2.1s drive the MAXX 2s, they did so with all of their best attributes intact and with no deficiencies in terms of large-scale dynamics or ultimate loudness. Then there was the matter of Nordost Valhalla interconnects, whose retrieval of low-level detail was proven superior to that of every interconnect I had on hand except for one: Siltech Signature G6 Forbes Lake, which sounded more tangible throughout its range than Valhalla. You'll read more about these Siltech interconnects very soon; as with the Esoteric digital gear, hearing such fine distinctions would have been difficult without the MAXX 2s. Some speakers are better than others at letting the music flow from them, at sounding effortless. I would argue that this is a matter of distortion, that music flows when the signal is not impeded by the speaker's inherent noise. Speaker distortion is something that's addressed not only in the drivers and crossover, but also the cabinet, which ideally should damp the constant movement of the drivers and thereby not propagate it through the speaker -- and the music. It's obvious with a speaker as massive as the MAXX 2 that distortion is a primary concern, and it shows in the music, which releases from the large cabinets with great quietude, helping to create the MAXX 2s' realistic sense of speed and dynamic prowess. This is what's so startling about the X-2 Alexandrias as well, that they seemingly liberate the music from the equipment. On top of all this -- the extremely wide bandwidth and low distortion, the dynamic agility, the ability to sound large or small depending on the recording, the response to changes in the system, the effortlessness -- the MAXX 2s are just plain enjoyable. As much of a trophy speaker as it is, the MAXX 2 is wasted if not playing great music, much in the same way a sports car is wasted sitting in rush-hour traffic. Hearing the X-2 Alexandria was a thrill; living with the MAXX 2 has been as well. Given the great difference in price between the MAXX 2 and WATT/Puppy 7 ($22,700 per pair), it should be understood that the MAXX 2 is the better speaker. But what many of you reading this review will want to know is how much better. My feelings on Wilson Audio's well-known two-piece system are, well, well known. I reviewed the WATT/Puppy 7 in late 2002, and at CES 2003 we presented David Wilson our Hall of Fame award as much for the idea of the WATT/Puppy, which has been copied by various speaker designers since its debut, as for the most recent iteration of the speaker, which improved on the WATT/Puppy 6 to a degree that I didn't think possible. I've used the WATT/Puppy 7 as my reference speaker since my review, and before that I used the WATT/Puppy 6, which I've also written about. Yes, I admire these speakers -- they provide two things that are necessary for me these days: wide applicability, meaning they can be used with a great array of ancillary products, and pleasing sound, meaning that they are very easy to enjoy. I could say more, but it's all in my reviews. Before the MAXX 2 arrived, I had my doubts that it would outclass the WATT/Puppy 7 in every respect, let alone to a degree commensurate with the difference in price. After living with both speakers, I'm convinced that the MAXX 2 may very well be twice the speaker of the WATT/Puppy 7. In any case, it is a step up in every musically important way. First, a speaker the size of the MAXX 2 presents music in a manner different from even an extremely good smaller speaker like the WATT/Puppy 7. The MAXX 2 is much taller, which fills out the soundstage vertically, and its larger woofers portray bass with greater depth and power. There is also the quality of that bass. While the WATT/Puppy 7 is extremely good down low -- better than any speaker its size or price that I've heard -- the MAXX 2 is better still. The depth and weight are mated to speed and dynamic expertise that only the Wilson Audio X-1 and X-2 have equaled (and in their cases, bettered). One sonic aspect at which both the WATT/Puppy 7 and MAXX 2 surpass every other speaker I've heard is the mix of high resolution and low distortion, which leads, I believe, to their very agreeable character. The MAXX 2 takes this a step further because of its increased bandwidth and massive dynamics -- there is definitely more of the recording present, so there is more to enjoy. In the end, the WATT/Puppy 7 is not diminished by the MAXX 2 -- it's a state-of-the-art small speaker. But the MAXX 2 is better, as it should be. The formula for musical realism includes many sonic elements that ideally come together to re-create the sound of live music. Reproduced music may not sound exactly like live music in every way, but it has to suspend disbelief for it to be considered convincing. Even though I write about audio equipment, I am often perplexed by how some audiophiles define musical realism, especially in terms of the sound of speakers. Two examples: horn-loaded and single-driver speakers. These are often paired with single-ended-triode amps, and the sonic outcome is considered musically real. Such speakers are severely limited in many respects but maximized in one: their ability to play loudly with little power. One can certainly enjoy this sort of sound, even love it, but it is not convincing. There are too many limitations. The MAXX Series 2 speakers seem engineered to banish limitations to the vanishing point while presenting music in a wholly enjoyable, and convincing, manner. That they can play loudly with 18 SET watts from a pair of Lamm ML2.1 monoblocks only speaks to the entirety of their performance. Yes, a pair of MAXX 2s is wildly expensive, but no less-costly speakers that I've heard come close to their musical command, and that they are obviously cut from the same sonic cloth as the far more expensive X-2 Alexandrias at least suggests that they may be a bargain of sorts. But the true value of the MAXX 2s is derived solely from their performance, which has shifted my personal paradigm for reproduced sound. Because of their extremely wide bandwidth and grand dynamic capabilities, the MAXX 2s simply reproduce what lesser speakers can't, which makes them valuable tools for reviewers. But what will matter most to music lovers is the sheer enjoyment derived from listening to favorite recordings on the MAXX 2s -- a rewarding experience indeed. Would I buy MAXX 2s? Absolutely. They are the most significant product I've written about in my eight years as an audio reviewer. Do I covet the X-2 Alexandrias? Absolutely. However, the MAXX 2s certainly take the edge off such longing. With them, my system has cracked the top five. Price: $44,900 USD per pair.